Tags: Bruno Volkmann, Marty Mathis, Matas Cimbolas, partypoker, South America. Posted on Tuesday, March 26, 2019 by "T". 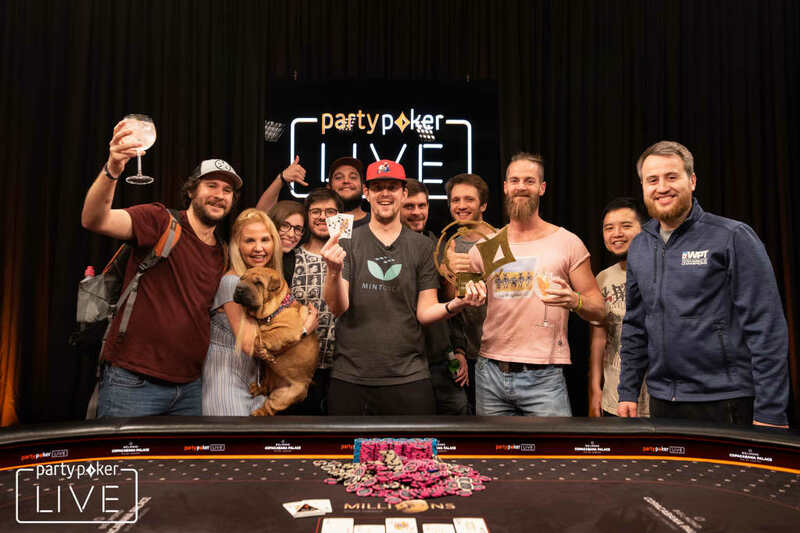 This year's partypoker MILLIONS South America Main Event champion has been crowned, and it was Marty Mathis who got it this time after outlasting a player field of 439. It took six full days of poker action, but it was all worth it for Marty Mathis as he bagged $894,844 in this event. This amount is the biggest live tournament score so far in his poker career. The final day started with six players remaining. Brazilian pro Bruno Volkmann is the chip leader with over 146 million, while Mathis at that time was the second shortest stack with only 29.9 million in chips. He was able to claw his way up, until there were only three of them left. During three-handed play, they all agreed to a deal that redistributed the prize pool a little bit. As the short stack, Lithuanian pro Matas Cimbolas locked up $571,504, Mathis got $681,048, and Bruno Volkmann secured himself $703,625 since he was chip leader. This meant the remaining $218,199 and the title will go to whoever wins in the end. After the deal was struck, it didn't take long for Matas Cimbolas to hit the rail courtesy of Mathis. He then had about 240 million in chips as he got into heads-up play against Bruno Volkmann who had 199 million. The board revealed A-J-3-7-10, and his kicker earned Mathis the pot and the title. He said after he won, "I've been waiting for this moment for twelve years. It means the world to me." 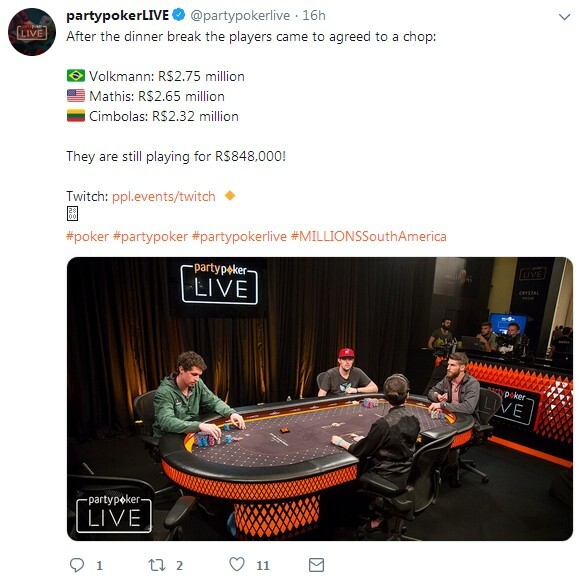 8 comments for "partypoker MILLIONS South America Main Event won by Marty Mathis"
Many congratulations to Marty Mathis on winning this huge event and equally big first prize. It must be fantastic to be able to travel the world and play for life changing money, someday someday!!! Sometimes it's worthwhile to wait for 12 years and to win 1st place in a tournament and over 800,000 of dollars your prize. Other players have tried the same thing but they were not so lucky. This poker is much easier for high-caliber players but even so it is very difficult to win 1st place in a big tournament. playing for six full days a tournament of poker. 10k USD buy in, for a win worth 900k USD. Not bad for six days "work"
It must be fantastic to be able to travel the world and play for life changing money, someday someday!!! 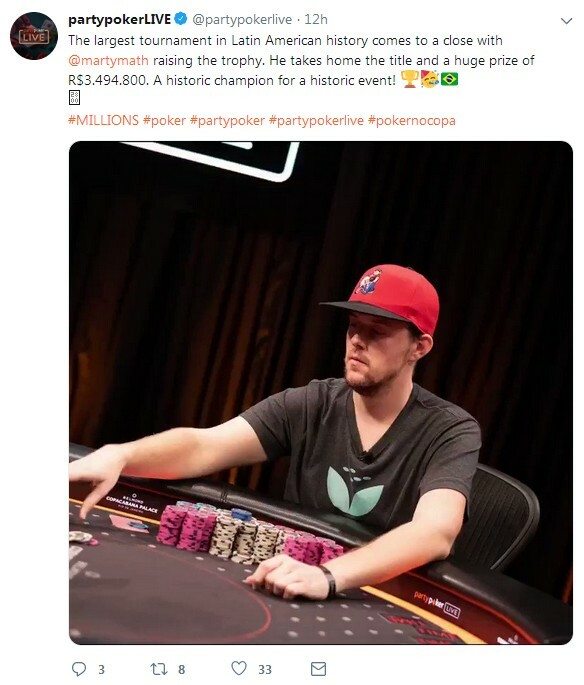 very nice amount for the winner with big buy in!his investment of over 10 K was good and now he got almost 900 K!to enjoy in rio,to be in this kind of hotel and then to win first place is something special!probably we will hear about him again this year! I mean I was kinda half-joking, half-seroius about the abduction. If he was to enjoy all these money right down in Rio with all his friends, he is going to need some bodyguards and luck to survive the first night Or not. you can imagine what he done in this days and what has happen after his win on this tournament!we can just imagine what was scenario for this!hope that this was with some women party,not only mens !this just be big success for him!